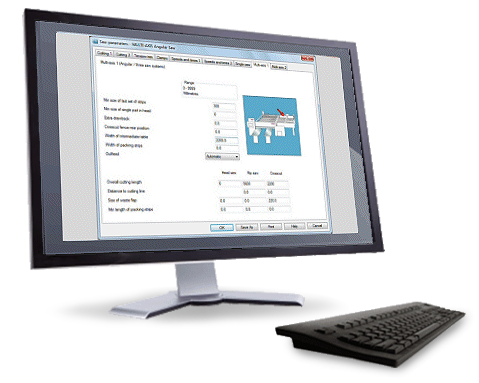 The Saw Interface transfers patterns or cutting instructions and where appropriate online printing data to your CNC-controlled saw, and it will estimate the cutting times for each job. This feature is only included with the Standard Optimiser and Professional Optimiser modules. Transfer to saw dialog - the data to be transferred is displayed. A wide range of formats for different saw types are supported. The cutting times will be considered for minimum overall production cost. Export of pattern exchange PTX files in ASCII\Unicode, ACCESS MDB or SQLite database format, ASCII CPOUT or DXF file format. Extensive parameters allow detailed estimates of cutting time for single and multiple axis saw systems, based on saw carriage and program fence speeds and clamp positions. Data from the saw can be analyzed to monitor saw productivity and provide a shift analysis. Actual cycle times can be compared with theoretical estimates and a variance report produced. The saw interface allows patterns or cutting instructions to be downloaded to your CNC-controlled saw and estimates cutting times for each job, eliminating setup times and avoiding errors in production.